Social networking portals allow us to stay in touch with our parents, friends, co-workers, etc. Video streaming sites have 1000s of educational videos. Despite knowing the importance of portals like YouTube, Twitter, Facebook, and many other sites, some governments don’t allow their citizens to access certain websites. Fortunately, you can access any of the blocked websites through a proxy website or a VPN app. Privacy: A server located in another country will handle your connection. If you’re logging into websites through VPN app, you should make sure that the app is secure. Speed: Once you turn on VPN service on your handset, the browsing speed will drop. The speed depends on the quality of service offered by the VPN provider. If a big company has offered a virtual private network connection, the upload/download speed will be good. Apart from providing access to websites blocked by the ISP and the Government, the VPN apps allow users to surf websites anonymously and securely. VPN Master is the most popular Android VPN app. It has an excellent rating of 4.6 on the Google play store. The app has 1+ million ratings and 50+ million active users. VM scans your connection speed/type, after which it prompts the user to activate VPN connection. When the app was launched, it had a bandwidth restriction of 500 megabytes. Now, there’s no such restriction. VM has servers in the United Kingdom, US, Singapore, India, France, and many other locations. VIP users of this app enjoy more than 8 locations. The app features a network diagnosis module which checks and makes you aware of various network problems. It is user-friendly. Over 300 million people across the globe use several popular internet services owned by Cheetah Mobiles Inc on a regular basis. CM had launched its Open VPN proxy application to provide users with unrestricted and unlimited access to the internet. The company has set up its VPN servers at six different geo-locations. Users can select a location manually or let the app decide which location is the best for them. Apart from the unlimited VPN service, the app allows users to analyze a WiFi connection. If a connection is insecure, the app will warn you. The app contains ads. CM VPN rewards point to users who use it on daily basis. It is fast, stable, and reliable. As it uses the OpenVPN protocol, CM VPN is a secure app. 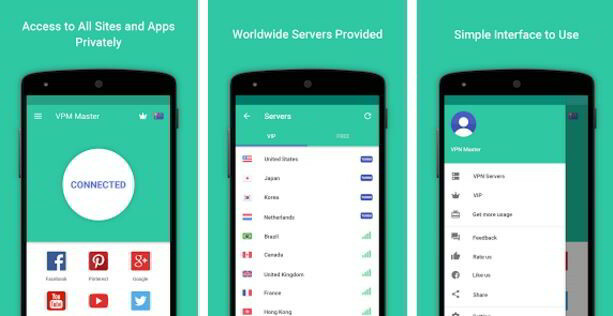 Touch VPN is one of the most downloaded VPN apps on the Play Store. It requires account registration. The app doesn’t have bandwidth or speed restrictions. It is compatible with all types of internet filters, firewalls, and mobile internet services. Touch VPN is easy to use. To use access blocked sites, install the app and run it. Now, register a new account or sign in with your Google/FB account. Once you log in, tap the Connect button. Like Cheetah Mobile’s VPN proxy app, Touch has servers located in various parts of the world. If you’re not happy with the browsing speed, tap the drop-down button above the “Connect” button and choose a location near you. 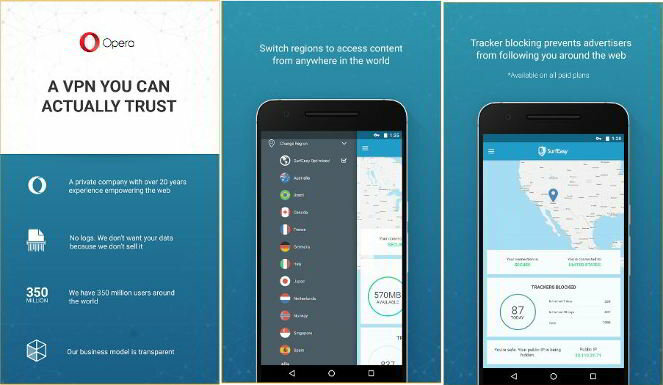 TouchVPN is a large app. Its size is around 39 megabytes. Once you enter the details, tap on create account button. The app will now load your plan details and it will display a popup to enable/disable VPN service. The main interface of SurfEasy app is beautiful. The app shows a map of the region where VPN server has been set up. SurfEasy offers a one-click option to block trackers. The app lets you add a home screen widget to disable or enable VPN on one-click. It imposes 500 megabytes data transfer limit on each account. It lets you earn data. To earn free data, confirm your email address, install the app on another device, or like SurfEasy fan page. SeacureEasy has the option to encrypt data transferred over unsecured free WiFi hotspots. Like the above app, SE provides several locations. It is one of the best VPN apps for 2076. BetterNet has a simple UI that lets users enable or disable virtual private network with a single click. It gives users the option of choosing a VPN server location manually. 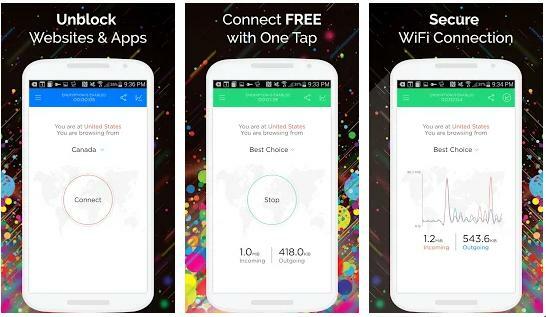 The app’s premium version provides seven US-based, and other 4 additional VPN server locations. It doesn’t allow non-paid users to change the geo-location. This is the only drawback of Betternet. Conclusion: Companies are setting up free hotspots at public places. They are also blocking websites that you may visit in leisure time. To bypass the restrictions, secure your connection and enjoy access to any website on the internet, you must download and use one of the above mentioned best VPN apps for Android devices. I’m using paid vpn since i know they provide real privacy and security compare to using free vpn. I’m using Astrill for 2 years on my android right now. It’s understandable if out of the blue the service encounter blockage of some sort. The most important part is that the service can provide immediate solution. I found astrill very fast in providing solution, im very satisfied.